In our first blog, we promised to ”present ways to mitigate the financial risk of certain employee mobility policy provisions, concentrating on the high cost items first”. We also said we would ”address issues that are considered irritants for employees”. Here is a two in one – Guaranteed Home Sale Plans. 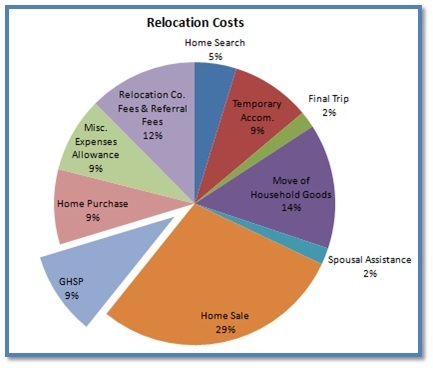 Although the actual cost of Guaranteed Home Sale Plans (GHSP) may not be, on average, the highest cost provision of your relocation program, it does represent one of the highest financial risks to the corporation. Our employee satisfaction survey results (sent to corporations’ employees following their relocation) also demonstrate that this is the provision that ranks the lowest in overall satisfaction. 1. Eliminate GHSP: Some companies have done this, but it is difficult to do when relocating employees have come to rely on this provision to move quickly at low financial risk to them. Managers also expect that employees will move quickly and hit the ground running in their new positions. Not being able to sell one’s home quickly may mean more time separated from the family, more time in temporary accommodation, more time worrying about trying to sell the home, all of which may not result in lower overall costs. 2. Reduce the Guaranteed Price: Rather than offering 100% of the average of 2 appraisals, offer 90% or 95% instead. This reflects that the GHSP really should be ”safety net” if the house does not sell in 90 days or so, not reflect a higher value assuming all stars are aligned to find a good buyer. 3. Appraise using vacant value: When a property is vacant, its value drops by 5 to 10%. If the has not sold in the 90-day (or other) marketing period and the corporation takes over the property, it will likely be vacant. Consequently, if the property was originally appraised full of furniture, the property value declines upon take-over and the corporation is on the hook for the loss. By appraising using vacant value, the financial risk to the corporation is reduced and the employee still receives the ”safety net” price. Although the resulting price is similar as idea #2 above, from on optics perspective, providing this approach is more palatable. 4. Instruct appraisers to forecast the value: Particularly in a declining market, when takeover will inevitably result in a lower value, appraisers should be asked to factor in the impact of the declining market and forecast the sale price to the end of the marketing period rather than the beginning of that period. This is will reduce the corporation’s risk of loss on sale without jeopardizing the employee’s ability to obtain a fair price of the home. 5. Eliminate home sale bonuses paid to employee: Bonuses paid to employees if they sell above the guaranteed price within so many days (e.g. 60) or before takeover, do not provide incentives where they can provide most impact. Bonuses paid to employees, ranging from 1% to 4% of the selling price, only add to the overall cost in a favourable housing market when the property will likely sell before takeover anyway and add next to nothing in a declining or soft market . Incentives should be directed to potential buyers instead, who will be tempted by reimbursement of closing costs, new appliances, one year of lawn care, etc. 6. Change the rhetoric, change the message: Let employees know that the GHSP is a safety net.